Google Albert Einstein and you’ll draw about 93 million hits. That’s understandable for such a popular intellectual of the early 20th century. Google someone named “Charles W. Leadbeater” and you’ll get some hits; about 92.7 million fewer. Leadbeater would never be trending on Twitter or news on CNN compared to Einstein. Yet, his contributions to the enlightenment of the era were no less significant at the time they both lived. In fact, Leadbeater would have been much more likely to command headlines in the London papers. As a former Anglican priest turned spiritualist and metaphysician, Leadbeater was a leading figure in the relatively new Theosophical Society, a movement headed by Madame Helena Blavatsky. As Western culture explored the ancient rituals and philosophies of India and the Far East, interest in spirituality and the occult soared. Trade between India and the West wasn’t limited to tea, silk and exotic spices. The thought and spiritualism indigenous to the region became its greatest intellectual export. Leadbeater made his way to India in 1884 to study under the guidance of Master Kuthumi at Adyar. Diving deep into the pool of knowledge evidenced in the Vedic texts and lore of the ancient rishis or wise men of ayurvedic wisdom, Leadbeater came to understand physics and energy along a path parallel to Einstein’s but from the exact opposite side of cognition. Both men provided illuminating and thought-provoking quotes: “Not everything that counts can be counted,” from Einstein and “It is a mistake to consider that the limit of our power of perception is also the limit of all there is to perceive,” from Leadbeater. Same idea, different theaters. Einstein was one of the brilliant breed of physicists working on the formative Western-science concepts of relativity and quantum physics. Leadbeater studied what was already known about atomic physics but on a much subtler level. While Albert was entrenched in Western empirical observation, C.W. was deep into the recently revealed ancient Vedic texts. Leadbeater didn’t explore the outer reaches of space and time but instead took the course of the rishis: understanding the universe by understanding within. Einstein was known for E=mc2; Leadbeater for his 69 published works, including his short book describing the chakras. Both Einstein’s equation and Leadbeater’s teachings describe energy. Ancient knowledge for modern times. Thousands of years ago, the wisest of the Indian scientists understood quantum physics and atomic theory in their own way. Without the technical tools to measure energy in the same ways we do today, they measured or experienced it in other, more subtle, ways. Their science was a combination of sensible observation of nature and intuited knowing. Thousands of years later, Einstein, the scientist of our age, would often credit the value of the intuitive mind when it comes to knowledge. The rishis’ works were eventually written down in texts known as the Vedas. Leadbeater studied the texts in the late 1800s and interviewed yogis who were still knowledgeable in the science of ayurveda. In 1927, Leadbeater published The Chakras. All things are energy. What appears to be solid is really a coalescence of energy; that singular energy Einstein called the Unified Field, ancient rishis called prana and Chinese call chi. Just as a cup has points of contact where it rests on a table, humans have points of contact with the energy of the universe. Existing in a sea of energy, we must have points of interface with it. These specific intersections connecting individual energy with universal energy are called chakras in the Vedic texts. Big wheel keep on turning. 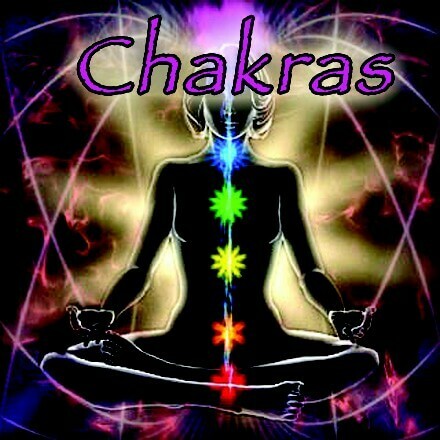 Chakra means “wheel” in Sanskrit. If form and function are related, imagine that a chakra is a wheel-shaped vortex or channel between the body’s energy field and the universal energy. In appearance, and there are those who have seen them to describe them, a chakra looks like the aperture of a camera. Like an iris can open or close, so too can a chakra. An iris regulates light. A chakra regulates energy. Like the cup on the table, there are many points of contact. The body has seven main chakras. Each is specifically located and has its own characteristics. As the main chakras progress from numbers one through seven, they grow more complex, often compared to a flower’s bloom; the simplest with four petals, the highest with 1000. The Magnificent Seven. The first chakra, in Sanskrit Muladhara, is located at the base of the spine. It is the Root chakra, attendant and attuned to the most base energies. The second chakra is controversial. Some sources call it the spleen chakra. It is not. The second chakra is actually the Svadhishthana and is in the area of the reproductive organs. Victorian prudishness of the late 1800s prompted Westerners to adopt sexual denial. The third chakra is the navel chakra, Manipura. The fourth chakra, Anahata, is the reddish heart chakra, emerging in the area of the heart and solar plexus. Fifth is the throat chakra of communication, Vishshuddha. Next is the brow chakra, Ajna and then finally, at the very top of the head is the crystal white and complex crown chakra, Sahasrara. Physiologically, each of these areas is specially innervated. You can find them easily, intuitively. Press on your solar plexus, navel, base of your throat or between your eyebrows. There is no mistaking that those areas feel totally different from just a few inches to either side. The chakras are sensitive to energy even more so than to touch. When chakras become blocked, constricted or otherwise compromised, energy does not move through them easily. Resisting energy causes disease, as surely as plaque blocking our arteries or thought limiting our awareness, the result is the same.